For IMGs who failed the exam, in what component did you fail? View Poll Results: In which CS Exam Component Do IMGs usually fail? Multiple Choice Poll. Voters: 188. You have to register to vote in this poll. It would be really useful if we could start a poll and check in what components do IMGs fail the most in CS. Please note that this is a multiple choice format and you can choose more than one choice depending on if you had more than one performance reaching the lowest performance threshold (with a star). You can see in the above example that the student has failed in Date Gathering only. 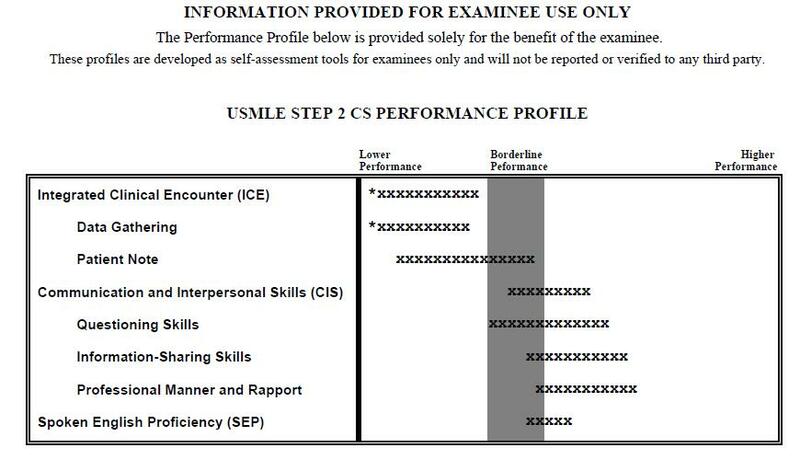 Note that I purposefully omitted the ICE (Integrated Clinical Encounter) and the CIS (Communication and Interpersonal Skills) because they are the sum/average of (Data Gathering and Patient Note) and (Questioning Skills, Information Sharing Skills, and Professional Manner and Rapport) respectively. Please do not vote if you have not failed the CS exam! Thank you so much for the great interest in the poll! Let's see if other test takers can answer as well! I think i did the worst compare to anyone here and is very disappointed in myself. I failed ICE and CIS sections but passed SEP. So scared now. I thought i asked all the questions but might have appeared rushed. I did had lot of spelling errors in the patient note. and i couldnt complete the neuro exam in one of the patients. I think It is something more serious. If I will be you, I will go to the one of the prep courses. I think this poll ought to be modified. They no longer report the specific areas under ICE and CIS.